May was considerably subnormal as to the precipitation and slightly above the average as to the temperatures. 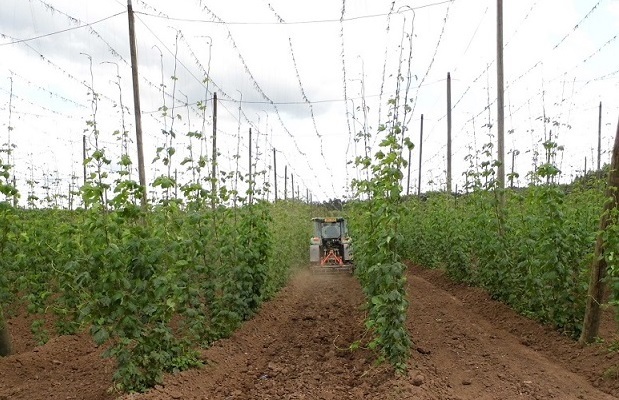 In comparison with the long-term average the water deficit ranging around 30 mm affected the hop plants already. The hop growth slowed-down and the habitus of the bines is a bit weaker and oblong. The growth of new baby plants has been nearly stopped due to the drought. The hop plants are in a very good health condition. The first chemical treatment against primary infection of Peronospora was already effected and the second treatment will be finished within first days of June. Chemical protection against Alfalfa snout beetle and Fleabeetle was applied where necessary. Sporadic appearance of hop aphids did not require any action. The first hop training was already done and the second will be finished at the beginning of June. At present the fertilizing, first hilling and cultivation of the space between the rows is effected.